INCLINE VILLAGE, Nev. — With wildfire potential in the Lake Tahoe Basin this year expected to be above normal, officials are encouraging homeowners to do their part this season. 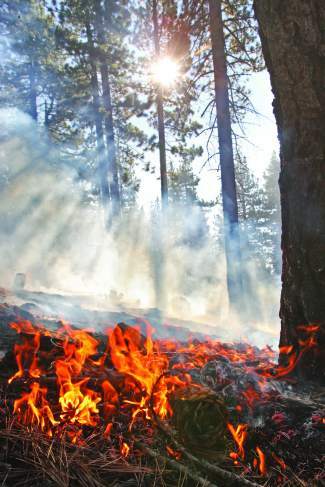 “Fire is unpredictable, so it’s important to create defensible space every year and maintain it,” advised Forest Schafer, forester for the North Lake Tahoe Fire Protection District. Defensible space is the buffer between a house and an oncoming wildfire where the vegetation has been modified to reduce the threat of wildfire, according to the district. Ways to create defensible space include removing dead plants from your yard, cleaning up dead and dry pine needles and leaves and trimming trees to keep branches away from those on other trees, among other tactics. NLTFPD, which covers Incline Village and Crystal Bay, will have free defensible space evaluations and chipping services for property owners starting May 22, with requests being taken now, Schafer said. For chipping, homeowners are advised to make sure their pile is curbside and easily accessible; must not exceed 10 feet by 10 feet; and must not contain stumps, roots, garbage, nails, lumber or pine cones. Chips will be left on site, Schafer said. To request NLTFPD’s defensible space evaluation or chipping service, call 775-831-0351, ext. 8118, and leave your name, phone number, address and service request. Online sign-up is also available at http://www.nltfpd.net by going to the “wildfire risk reduction” tab and clicking on the “defensible space” option. “Defensible space around a home is the last and most important line of defense during a wildfire, provides a safe working area for firefighters and makes it more likely for a home to survive,” Schafer said. Additionally, free residential curbside yard waste recycling collection will be offered starting next week, courtesy of Waste Management and Incline Village General Improvement District Waste Not, according to a press release. Users of the service must use approved green bags or any 3 milliliter clear bag, fill the bags with vegetative yard waste and securely close or tie them, and place up to 12 bags curbside on each bi-weekly recycling service day between May 6 and June 28. For questions, call Waste Management at 775-831-2971 or Waste Not at 775-832-1284.